An unidentified man blew himself up today outside a polling station in Grozny during presidential elections in the war-torn Caucasian province of Chechnya. The blast came as Chechens voted to elect their new President in mid-term elections following the assassination of former President Ahmad Kadyrov in a bomb blast on May 9. Hundreds of people, including war veterans and the country's top officials, gathered in the city of Banska Bystrica today to commemorate the 60th anniversary of the start of the 1944 Slovak National Uprising, a revolt against the Nazi rule. SURREY (CANADA): A book dedicated to the 400th anniversary of Guru Granth Sahib, ‘Toward a Global Perspective’, has been released at Gurdwara Singh Sabha, Surrey, BC, Canada. Written by prominent scholar Dr Sawraj Singh, the book has been published by the Words Worth Press and printed in Canada by the local Gurdwara Singh Sabha. MR Greg Dyke on Sunday launched a powerful attack on Lord Hutton whose report led to his forced departure as head of the BBC. The former Director-General of the BBC sought to exact his revenge on those he blamed forhis resignation in advance of the publication of a new book. High on his list of targets was the law lord, whose report into the death of the Government weapons scientist David Kelly was regarded by many as a whitewash. HUJAI behind attack on Sheikh Hasina? Diplomatic observers here are taking with a pinch of salt the claim of responsibility by an unknown organisation for the terrorist attacks at an Awami League rally in Dhaka earlier this week. As many as 20 persons were killed and more than 100 injured in the attack, Though a so-called militant organisation Hikmat-ul-Jehad has issued a press note claiming responsibility for the attack, observers here feel that this claim is a smoke screen. 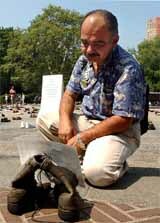 Fernando Suarez del Solar kneels in silence at his son Jesus del Solar’s boots that he used while training before he was assigned to Iraq, where he was later killed, at the Eyes Wide Open exhibit on Saturday in New York’s Central Park. Fernando created Guerrero Azteca (Aztec warrior) in his son’s name to teach young people about the reality of military service. The man was carrying a package outside the voting station in Zavodshi district of the Chechen capital when he was stopped by the police, a spokesman for the Chechen electoral commission was quoted as saying by Echho Mosckvi radio as saying. “When the security services wanted to check what he had in the package, he started running and then blew himself up,” he said. No other casualties were reported in the incident. Russia’s warn-torn province is electing its President under a tight wrap of security following twin suicide attacks on civilian planes in which 90 persons were killed. In all, seven persons are in the fray, including Interior Minister Alu Alkhanov, who has the backing of the Kremlin and most of the warlords, who have sided with President Vladimir Putin after years of guerrilla war with the federal troops. An over 14,000-strong locally raised Chechnya police force is assisting the federal troops in ensuring the security of voting at 430 polling stations. The uprising was crushed by the Germans at the end of October 1944, but guerrilla fighting continued in the mountains until the next spring. With the revolt, Slovakia joined the worldwide coalition against the Nazis in World War II. Over 60,000 soldiers and thousands of partisans and civilians from Slovakia as well as the erstwhile Soviet Union and 31 other nations joined forces and turned against the Slovak government and German troops who had just embarked on their occupation of this central European country. A large number of scholars, writers and journalists belonging to the Sikh community in Canada participated in the event. Speaking on the occasion, Dr Sawraj Singh said the message of Guru Granth Sahib was a message of universal concern, universal well-being, universal brotherhood and the unification of mankind. He said Guru Granth Sahib preached that since all human beings, other living organisms and non-living objects were created from one ultimate (eternal) reality, they were all related to each other. He emphasised that this message was relevant and important in globalised society. He further said this was needed to prevent a clash of civilisations, to save the world from impending disaster and to maintain peace and order in the world. MR Greg Dyke on Sunday launched a powerful attack on Lord Hutton whose report led to his forced departure as head of the BBC. The former Director-General of the BBC sought to exact his revenge on those he blamed forhis resignation in advance of the publication of a new book. High on his list of targets was the law lord, whose report into the death of the Government weapons scientist David Kelly was regarded by many as a whitewash. Lord Hutton was also condemned on Saturday as a “Guantanamo judge” by the former BBC defence correspondent Andrew Gilligan in what appeared to be a coordinated attack by two of those most criticised in the official inquiry into the affair. Mr Dyke also lashed out at three BBC governors he blamed for leading a campaign to oust him soon after Lord Hutton’s report was made public on 28 January. As reported exclusively in the Independent at the time, the former Director-General was shocked when his offer of resignation, made in an initial governors’ meeting, was accepted two hours later at a second gathering. Mr Dyke thought that Mr Gavyn Davies, the former chairman, had secured his future by tendering his own resignation. He blamed three governors - Ms Dame Pauline Neville-Jones, Mr Baroness Hogg and Mr Lord Ryder of Wensum - for ousting him. The book, Inside Story, extracts from which were published on Sunday, revealed how Mr Dyke met Mr Davies and Ms Dame Pauline immediately after they received advance copies of Lord Hutton’s report, which was highly critical of the BBC. Diplomatic observers here are taking with a pinch of salt the claim of responsibility by an unknown organisation for the terrorist attacks at an Awami League rally in Dhaka earlier this week. As many as 20 persons were killed and more than 100 injured in the attack, Though a so-called militant organisation Hikmat-ul-Jehad has issued a press note claiming responsibility for the attack, observers here feel that this claim is a smoke screen. These were the “signature attacks” with the imprint of professional people. Awami League Chief Sheikh Hasina was the prime target of these audacious attacks but she escaped. She was standing on a truck when the terrorists hurled grenades and opened indiscriminate firing at the rallyists. The needle of suspicion, diplomatic observers say, points to fundamentalist organisation Harkat-ul-Jehad-al-Islami (HUJAI). The grenades hurled were made in China, normally used by Pakistan army. As per eyewitness accounts published in Bangladesh newspapers, the grenades were thrown into the rally from the rooftops of the buildings. The series of attacks in the recent past on Awami League meetings in Narayanganj, Bagherhat, Sunamganj, Gazipur, Khulna and Natore demonstrate a pattern. What has surprised many is the manner in which the police probe is being held and also the reaction of Prime Minister Khaleda Zia who did not even bother to telephone Sheikh Hasina, her arch rival. Begum Zia has remained indifferent to the prevalence of terrorism in Bangladesh. The main aim of HUJAI is to bring about an Islamic revolution in Bangladesh on the Afghan-Taliban pattern with greater objective of achieving international Islamic brotherhood in the South-Asian sub-continent. In the Arakan region in Myanmar, it has already established close links with Rohinga Solidarity Organisation (RSO) which is very active in Bangladesh and Myanmar. The HUJAI was formed in 1998 and has been closely associated with ruling Jamaat-e-Islami (JEI) and Islamic Oikya Jote (IOJ). It was in fact formed on the pattern of Taliban in Afghanistan and has sent more than 5,000 Bangladeshi mujahideen to Afghanistan. The estimated strength of the group is around 15,000. After the fall of Taliban, many activists of this organisation have returned from Afghanistan and are staying in Quami Madarsas in Chittagong, Cox Bazar and Bandarban districts. After the outfit was enlisted as a terrorist organisation by the US State Department, the HUJAI has been carrying out its activities secretly.